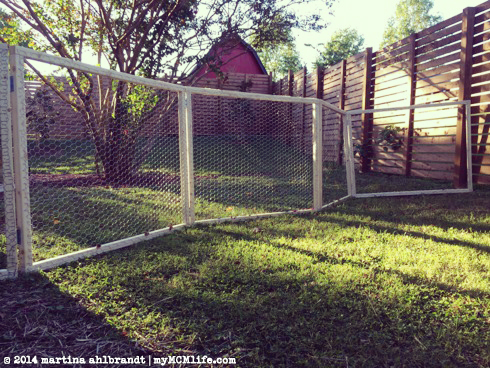 A simple Saturday afternoon project gave our chickens a lot more freedom. We’d been letting them out into our whole backyard sometimes, usually when we were home to supervise, because they’ve been destroying some of our garden plants and mulch beds and pooping on our patio. The worst was when Sunny, my super friendly hen, would stand at the backdoor step to look in and peck on the window, and then eventually drop a gift on the back step for us. Gross. 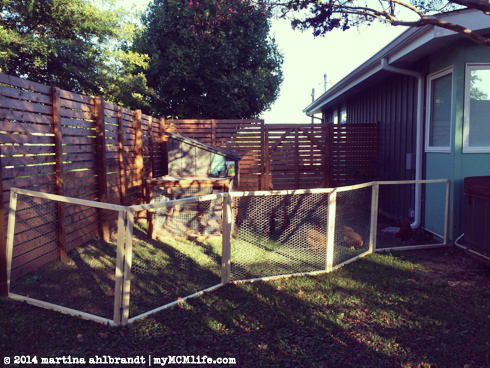 We decided that a portable, accordion-style fence would be a good solution to give them more yard space while still protecting the areas where we spend the most time. The girls are happy and I’m happy. It’s been a couple weeks and they’ve managed to eat all of the grass pictured here. We’ll be mulching the area in the coming weeks. If any fellow backyard chicken keepers are curious, it’s 3 feet high and we’ve only had some escapes early one. One chicken in particular got to the other side several times but then was pretty stressed out about being separated from her friends. 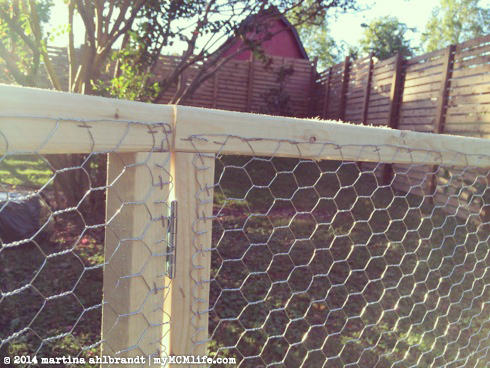 If it continues to be a problem, I’ll add a wire across the top of the fence so they’re not able to land on it. I’m pretty sure they’re not able to clear the fence without perching on it first but I’ve never seen an escape in action. We have five layers now. The sixth should be starting within a month. 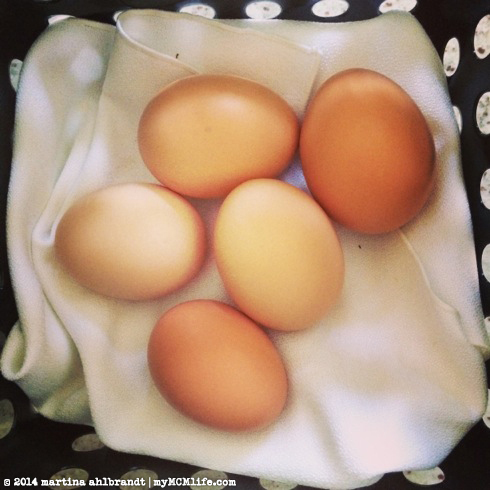 Omlet, the Buff Orpington, is the last one to join the party but I can tell she’s close because suddenly she’s not just unafraid of me—she runs to me—and then submissively squats if I reach in her direction. Last week I got to pet her for the first time since she left the brooding box. 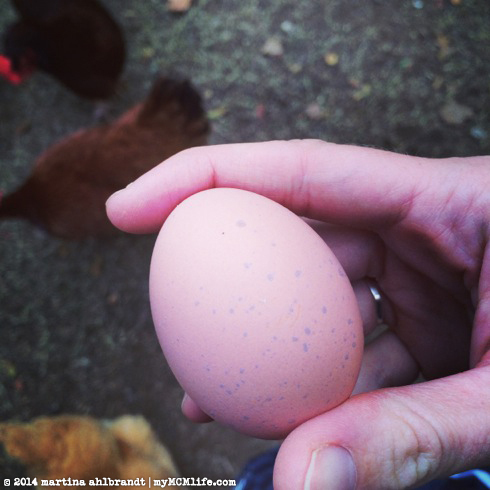 We’ve been getting 1 or 2 speckled eggs everyday. This was was particularly pretty with blue specks. I think it’s my Black Star, Poach, but I’m not positive. 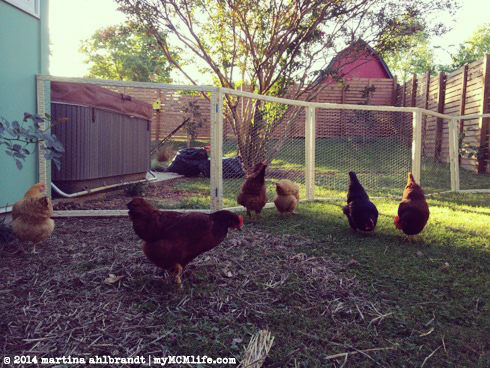 This entry was posted on Tuesday, October 21st, 2014 at 6:00 am and is filed under Family, Family: Chickens. You can follow any responses to this entry through the RSS 2.0 feed. You can skip to the end and leave a response. Pinging is currently not allowed.